The Moon is believed to have formed during the early history of the solar system when the young Earth underwent a massive collision with another planet that was about the size of Mars. The vast energy involved in this collision was sufficient to largely melt the entire Earth. Debris thrown out by the collision eventually accumulated to form the Moon. Efforts to date this Moon-forming event on the basis of radioactive isotope measurements have proposed a range of ages: some have argued for an early event, at around 30 million years after the birth of the Solar System, whereas others suggest that it occurred later than 50 million years, and possibly as late as 100 million years, after the Solar System formed. Planetary scientists from France, Germany, and the USA, funded by the European Research Council (ERC), simulated the growth of the terrestrial planets (Mercury, Venus, Earth, and Mars) from a disk of thousands of planetary building blocks orbiting the Sun. By analyzing the growth history of the Earth-like planets from 259 simulations, they discovered a relationship between the time of the Moon-forming event and the amount of material the Earth accretes after that giant collision. 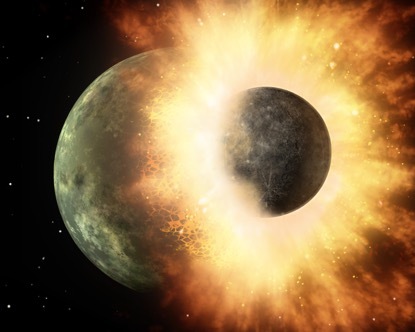 If the mass of material added to the Earth after the formation of the Moon is known, then this relationship provides a measure that can date the Moon-forming event. This is the very first geologic clock discovered that ticks in early Solar System history that does not rely on measurements and interpretations of the radioactive decay of atomic nuclei. A critical parameter in this consideration is the mass that has been accreted by the Earth after the Moon-forming impact. In order to understand its estimation one needs to appreciate that the giant impact also initiated the final round of core formation in the Earth, i.e. the segregation of iron from the other planetary material and its sinking to the center. In this process, iron takes along other elements, the so-called siderophiles, that are consequently absent in the remaining silicate portion of the Earth, i.e. the crust and the mantle. Geochemists have shown that the abundance of siderophile elements in the Earth’s mantle is directly proportional to the mass accreted onto the Earth after the Moon-forming collision, and consequently, a measurement of the siderophile budget of the mantle allows for an estimate of the mass added. Using the geochemical measurements, the newly established clock dates the Moon to 95 +/- 32 million years after the beginning of the Solar System. Since this dating method is an independent and direct measurement of the age of the Moon, it provides a powerful affirmation of radioactive dating measurements that indicate a relatively late age for the formation of the Moon. Newer PostPress Coverage for "Highly siderophile elements in Earth's mantle as a clock for the Moon-forming impact"